SFU instructors and students are engaged in a variety of community activities that are making a difference to Aboriginal children and youth. Last summer, in partnership with the Vancouver Aboriginal Friendship Centre (VAFC), SFU introduced its first summer camp for Aboriginal youth. Each day for one week the VAFC sent kids aged six to 12 years to SFU to experience the university and the variety of camps available. “We wanted to give the kids a taste of our summer camps and what it’s like to be at the university,” says Annette Yung, an SFU student who has worked for SFU Summer Camps for the past seven years. She organized a variety of activities, from mini-university classes in science and media communication, to sports games, computer classes, swimming and a mountain madness hike where they learned to build outdoor shelters. “They loved it,” says Yung, who is already planning activities for this year’s Aboriginal summer camp. Just two per cent of B.C.’s Aboriginal student population currently completes Principles of Mathematics 12, a compulsory entrance prerequisite for some post-secondary programs in B.C. The Math Catcher project, developed and operated through SFU’s IRMACS Centre, is an outreach project that is striving to improve Aboriginal students’ success in school mathematics programs. It receives funding from NSERC-PromoScience, SFU and The Pacific Institute for Mathematical Sciences (PIMS). The project incorporates elements of Aboriginal storytelling, traditions and culture into mathematics lessons, and promotes earlier teaching of basic skills and problem-solving. Since establishing the project in 2011, SFU senior math instructor Veselin Jungic has created five animated videos that introduce math concepts in an Aboriginal context to young students. Small Number and the Salmon Harvest is the latest video in the animated series about Small Number, a young Aboriginal boy whose adventures help students understand that math is all around them—in shapes, patterns, measurements and abstract thinking. 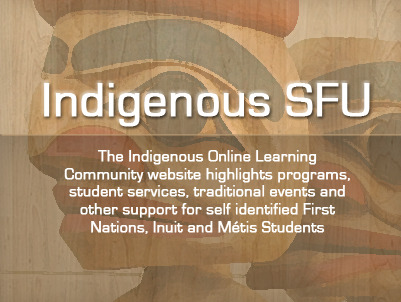 As well, Veselin and First Nations student volunteers from SFU have traveled throughout B.C. over the past two years to share their excitement for math with more than 2000 students in 50 schools. In 2014, Jungic is already booked into June to visit schools every week in towns such as Saanich, Kamloops, Port Alberni, Fort Langley and Squamish. He has also organized publication of three bilingual booklets about Small Number in a combination of English plus Blackfoot, Squamish and the latest, Nisga’a, published last November. Another book, in Sliammon, is underway. Math Catcher sponsors include SFU’s IRMACS Centre, the Faculty of Science, the Office for Aboriginal Peoples, and the Department of Mathematics, as well UBC’s Department of Mathematics and The Pacific Institute for Mathematical Sciences. For the past three years, Math Catcher has hosted a daylong Fall workshop at the Burnaby campus to introduce Aboriginal high school students to “hands-on” science and math. The goal is to encourage these youth to consider a post-secondary education in Science, Technology, Engineering or Mathematics (STEM courses). Last October, the popular event attracted 60 students and their teachers. They took a campus tour and attended presentations featuring mathematics and word puzzles in Cree, modular origami, 3D printing and actuarial mathematics. The five presenters included the first Aboriginal Canadian to earn a PhD in mathematics—Edward Doolittle from the First Nations University of Canada. Sponsors of the free workshop included the IRMACS Centre at SFU, the SFU Office for Aboriginal Peoples, the SFU Department of Mathematics and the Pacific Institute for the Mathematical Sciences (PIMS). For more information visit MathCatcher.irmacs.sfu.ca. Two days a week, SFU volunteers visit the Native Education College (NEC) in Vancouver to tutor college students in math or to help adult-education students who are working toward a Grade 12 diploma. The volunteer tutoring program, now in its fourth year, is an outreach program of the SFU Department of Mathematics and is organized through SFU’s IRMACS Centre and the NEC. The four tutors include SFU senior mathematics lecturer Randall Pyke and three students from the departments of mathematics and physics. The program is also open to students from the local Aboriginal community. “I’ve had some inquiries from parents wanting to send their youth here for tutoring, as well as from some students in the ACCESS pre-trades program and the First Nations Employment Society,” Lillian Prince, NEC’s program coordinator, Aboriginal Basic Education.